Caspla Bali Sea View Tours and Travel invites you to explore the Island of Nusa Penida. Located on the southeast of Bali Island, Nusa Penida is an exciting island destination with hidden paradise beaches, a spectacular location for snorkelling and diving, with fabulous scenery and recreation areas. Nusa Penida still has a traditional lifestyle like Bali 30 years ago. Nusa Penida Island is strategically located, with its sister islands, Nusa Lembongan and Nusa Ceningan, just south-east of Bali. The geography of the island is hilly, with a few flat areas and beautiful white sandy beaches and warm, sparkling azure blue seawater. Nusa Penida Island is also well known for its own rich culture, beautiful cultural dances, ancient temples and magnificent landscape panorama, both from the top hills, from where one gets magnificent views of Bali and its famous Gunung Agung, and down at sea level, where island outcrops jut out to trap the unwary boatsman. 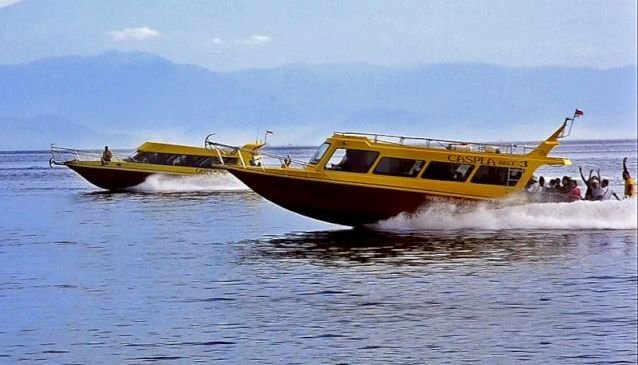 The trip to Nusa Penida Island takes 30 minutes from Sanur Harbour using our luxury speed boats with 200 HP X 3 engines, with seating capacity for 40 persons in each boat. We offer accommodation at Nusa Penida, Nusa Lembongan and Gili Islands. Luxury Fast Boat to Gili & Lombok Island. Surfing: The Nusa Penida region is visited by crazy surfers seeking way-out places to surf - spots like Lacerations and Shipwreck. Surfer or not, you're sure to enjoy the breathtaking views. Nusa Penida has some great hills and cliffs to climb, with amazing vistas at their tops. Nusa Penida Island as the part of Bali's Klungkung Regency but has its own history. The Nusa Penida Island was a place where the prisoners from Gelgel Dynasty on Bali were held in prison in the early 18th century, under the Majapahit ruler. The Gelgel Dynasty was one of the Balinese Kingdoms which once conquered Lombok Island. Before the Majapahit come to Bali, the Gelgel Dynasty conquered Nusa Penida, killing the last king of Dalem Nusa kingdom in Nusa Penida, as noted in the Babad (history, tales, genealogical account) Blahbatuh. In 2010, Nusa Penida was established as a Marine Protection Area of 20,057 hectares, under the district of Klungkung. Nusa Penida attracts 200,000 tourists each year, so the programme was instituted, under the auspices of Coral Triangle Centre, which trains marine resource managers and educates all groups that interact with coastlines and reefs within the Coral Triangle. The objective for Nusa Penida MPA is to protect the marine biodiversity of the area, sustaining fisheries, marine tourism and the welfare of the local communities.